Hit Up to accelerate, Down to brake or reverse, Left to turn Left and Right to turn right. Press Esc or Enter to pause and return to menu. Try to chase your targets within limited laps. Pass through green circles to accelerate your airplane plane, and avoid hitting the black cloud. As a classic skill game, Airplane Road, available on www.bestgames.pk for free, will delight you to a great deal. Let’s enjoy the game! On www.bestgames.pk there is a sport game Supercar Road Trip 2. Your mission is to reach the destination in the shortest time. Long press up key to accelerate to the highest speed, down key to slow down and left and right keys to tilt. Touch the blue arrow and orange arrow to do turbo and super turbo respectively. Avoid crashing into other things or driving away from the main road, or your speed will decrease. Upgrade your car after each level. 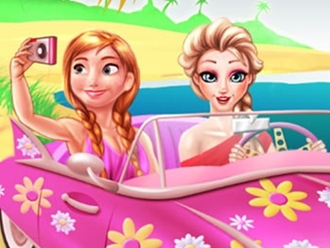 Join our princesses in their trip to the beach!They are going to spend a relaxing day at the beach.You can help them by changeing their swimsuits,hairstyle and bring them cocktails on the beach.After you dress them up they will take some selfies to post on facebook and instagram.Have fun playing Princesses Road Trip Fun!